Ashwin Mahabaleswara serves as the Head of Debt investments for Asia, Africa & the Middle East at DWM Asset Management (DWM). DWM is a private debt and private equity impact investment manager with a focus on emerging and frontier markets, and recently surpassed $1 billion in impact debt investments in over 40 emerging market countries. Ashwin also serves on the Loan Committee of Partners for the Common Good (PCG). Founded in 2000 and based in Washington D.C., PCG is a thought and innovation leader within the Community Development Financial Institution (CDFI) industry. Prior to joining DWM in 2012, Ashwin served as the Head of Finance & Treasury for Grameen Financial Services, a microfinance institution in India. 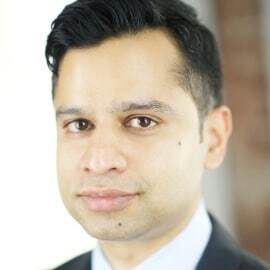 Previously, he worked in the Indian capital markets at JM Financial (formerly JM Morgan Stanley) and as an Investment Executive advising institutions and high-net-worth individuals at Scotia Capital and Berkshire Securities in Montreal. He served as the Chair of the Quebec Chapter of the Indo Canada Chamber of Commerce in Montreal from June 2007 to June 2008. Ashwin has degree in Economics from McGill University and holds the Chartered Financial Analyst (CFA) and Canadian Investment Manager (CIM) designations. He is fluent in Kannada and functional in Hindi.